Their restaurant is on the lobby, it's better than I thought. The bed was really comfortable and the staff were so helpful. The check in lady even went on a mission to find a plug so I could have my long awaited bath. The staff were pleasant and the food was very good. The room was clean and spacious, adequate storage and had two chairs which were comfortable. Good - beds really comfortable, evening food really good value but breakfast overpriced. Linen was clean towels were great bed and pillows were great. Pub was good with reasonable priced food and drink. Good location. Room clean and bed comfy, it gave me what i needed for a 1 night Business stay. Longshoot Inn This rating is a reflection of how the property compares to the industry standard when it comes to price, facilities and services available. It's based on a self-evaluation by the property. Use this rating to help choose your stay! Just 10 minutes from Lakeside Superbowl, The Longshoot Inn offers colorful rooms with private bathrooms. With Nuneaton just 5 minutes away, there is also free parking and a carvery restaurant on site. The spacious rooms at Longshoot Inn by Good Night Inns all feature free WiFi, a flat-screen TV and tea/coffee making facilities. Decorated with bright bedspreads and cushions. The restaurant serves traditional meals and a grill menu, with a daily carvery also available for an additional charge. The cozy bar offers a selection of cask ales and world wines in a casual lounge setting. A choice of Full English or continental breakfast is also available. 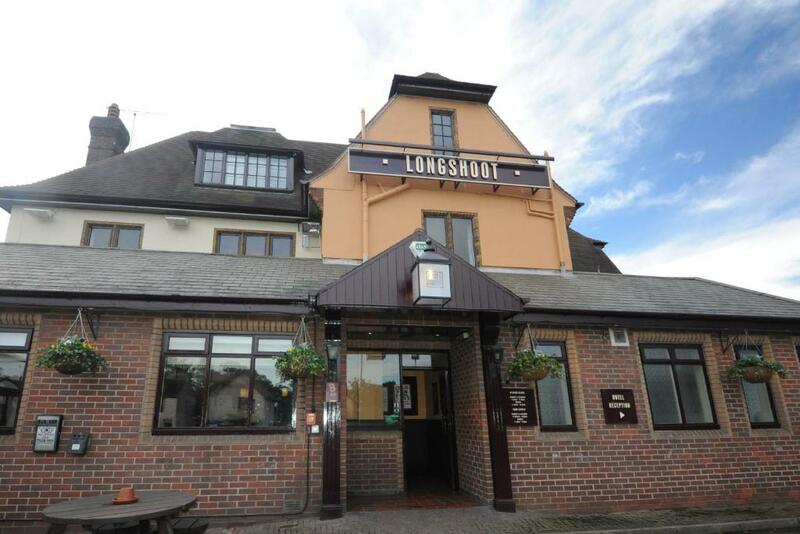 Located just 10 minutes from The Battle of Bosworth Field, Longshoot Hotel is a 25-minute drive from Birmingham NEC. Lively Coventry can be reached in 20 minutes, and Nuneaton Railway Station is a 5-minute drive, offering trains to Birmingham center. Other nearby attractions include Twycross Zoo, Mallory Park Racing Circuit, Triumph Motorcycle Factory and Stony Cove Dove Center. When would you like to stay at Longshoot Inn? Room features its own bathroom, free WiFi, a flat-screen TV, hospitality tray, and trouser press. House Rules Longshoot Inn takes special requests – add in the next step! Longshoot Inn accepts these cards and reserves the right to temporarily hold an amount prior to arrival. The exterior of the building looks battered. Bathroom very old and although it had been cleaned, didn’t have a very clean feel to it. Comfy bed and decent sized room. Area was lovely. Could do with a little re dec.
Out of date decor and furnishings/furniture. Bubbling wall paper. Staff were lovely. Basic but clean. Definitely value for money. The staff gave me no instructions about the WiFi, and it straight up did not work. The room was in a very tatty state, was kind of grim and dingy. No breakfast included with a B&B? This would all be fine on a tight budget, but at £52, I expected more. The location is a bit out of the way. The local taxi firm is expensive and should work with the hotel to give customers a special rate to town, train station etc. The staff were helpful as went out of their way to make the stay comfortable. Room and breakfast was fab and value for money. The hotel just looks a bit tired and needs a bit of TLC. The only downside is if having to use taxis as they are expensive. Maybe they should work with hotel to give special rates to customers. The bathroom was in a poor state of repair, but it was clean and the shower was very good. The check in receptionist was warm, friendly and informative. The beds and pillows were comfortable and although the rooms could do with some updating, they were clean. The restaurant and bar staff were very nice and friendly. The food was as you would expect from a chain pub/restaurant, nicely prepared and presented. Breakfast again was nice.